Bust Da Bank Free Online Slots: Play With NO Registration! Where to Play Bust the Bank for Real Money? Due to the weird and often highly inconvenient ways in which human psychology works, we’ve always been drawn to the things that we are not allowed to do. It has much to do with one’s strife for freedom, but that’s a topic for another article. However, it does explain the general fascination people have with bank heists. They’re heavily featured in movies, shows, video games, books, comics - and slots. That fascination is what Microgaming’s newest slot is playing on. 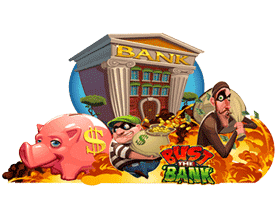 Bust the Bank is a solid slot game set up in the theme of a high-profile bank robbery, which is fitting. The end goal of playing slot machines and robbing banks is gaining large sums of money without having to invest years upon years of hard work. Naturally, we only endorse one of the two methods (which, for the record, is the first one), which is why you really ought to play Bust the Bank instead to sporting a ski mask the next time you go to make a deposit. How to Play Bust the Bank Casino Game? 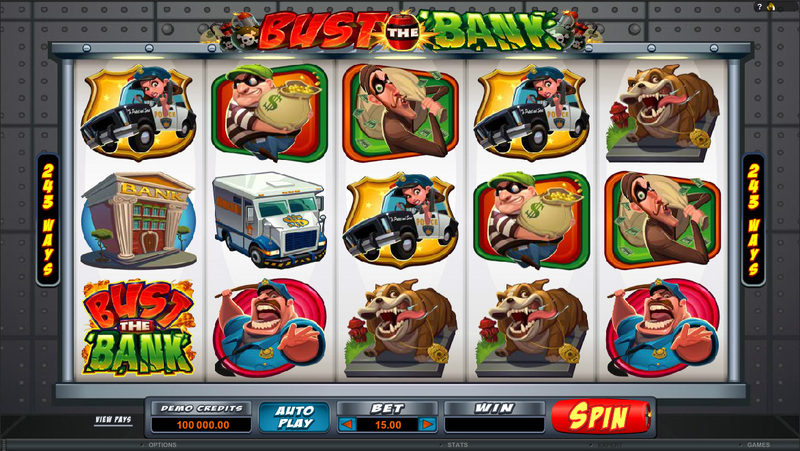 Bust the Bank is a five reel slot with the 243 payline Microgaming standard. The slot packs quite a few features to keep things interesting and wins high throughout the session. The betting range goes from 0.30 to 300, encompassing the low-to-mid audience. This is pretty fitting for Microgaming, as they tend to deal in more casual games. The 243 paylines also cater to this demographic, resulting in a pretty solid and fun low-risk game. The visuals of the slot are pretty nice. Cartoony scenes replace all symbols, so there are none of the regular card symbols present. The background is styled in riveted metal resembling a vault, with a large Bust the Bank logo up top. The spin button is a stick of dynamite, with the rest of the UI being pretty sleek and simple. The symbols are various images related to robberies - a large bank, a robber sporting a striped sweater, a robber who looks like a typical cartoon french stereotype, a police dog, two police officers and an armored truck. While the symbols are pretty exaggerated, but work in context. The symbols even come alive whenever you strike a winning line, as animations play on all achieved lines. There are quite a few bonus features in this game which help act as a counterweight to the low-wins provided by the many paylines. 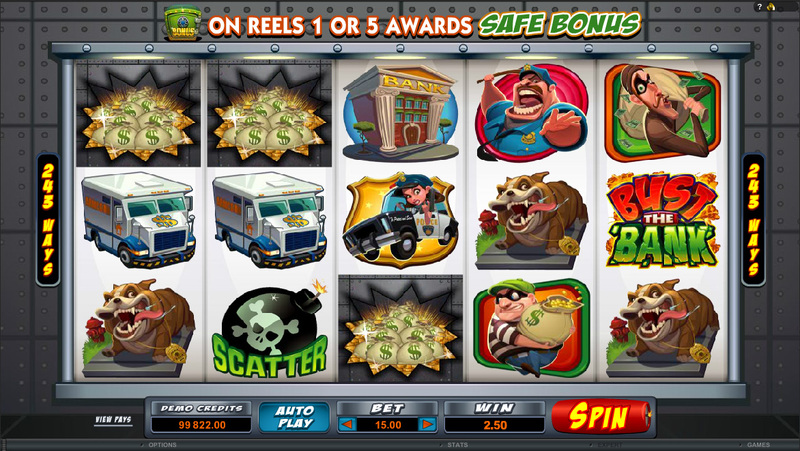 Landing a safe symbol on reels one and five will get you some bonus wins to your spins. In case those safes aren’t on the bottom symbol, all symbols below the safes will yield a similar reward. The Piggy Bank bonus triggers whenever you spin a titular piggy bank on reel three. 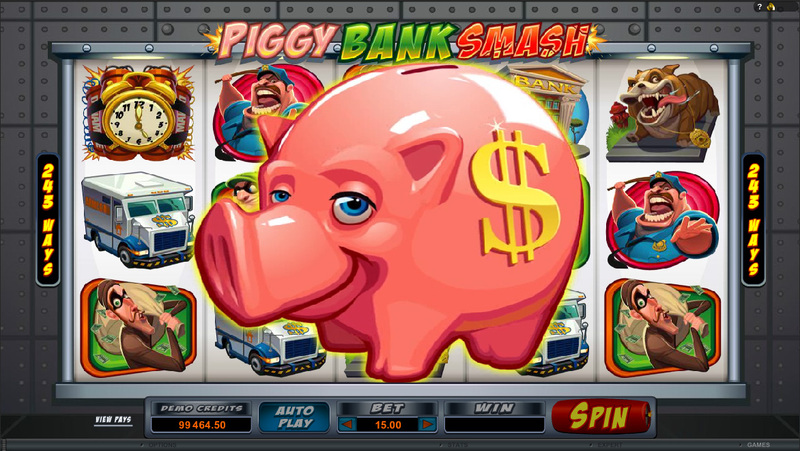 A large piggy bank will appear on the screen which you must smash to reveal a random cash bonus. The Larry & Bob bonus is a randomly triggering event which features the two robbers running across the reels granting you bonuses. However, the biggest bonus event you can hit is the free spin bonus. You trigger this by landing three or more Bomb symbols. 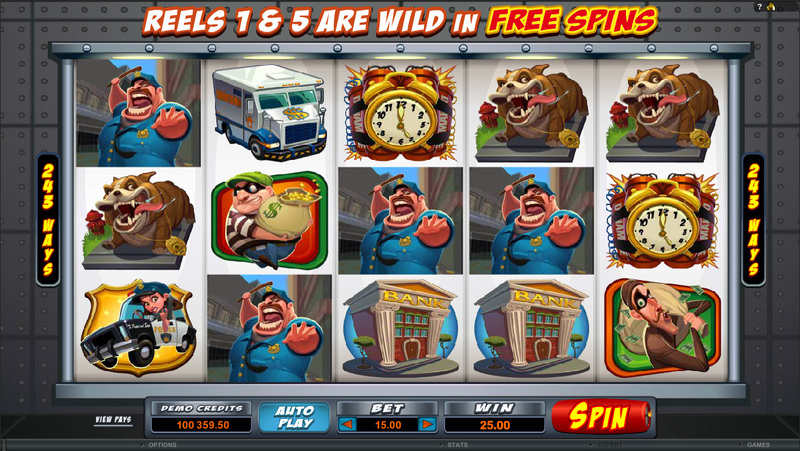 This will trigger 8 free spins during which the two reels on the side will act as constant wilds, while any further bombs hit will add another free spin to your counter. This particular bonus is what gets you the biggest bonus wins and is appropriately rare. 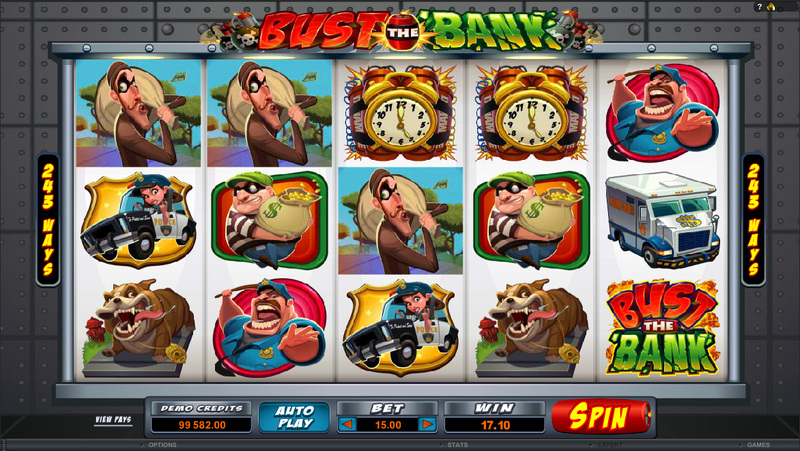 Being more of a casual game, Bust the Bank isn’t exactly the slot that will keep you on the edge of your seat throughout your session, but hitting those higher-paying bonuses like the Piggy Bank and Free Spins events will definitely give you an adrenalin boost. This won’t send your pulse off the hook, but it will get you pumped. Bust the Bank is a fun, functional casual slot with plenty of play features packed in to keep things sufficiently interesting while you play. It may not satisfy the high-rollers, but it is great for players who don’t have an unlimited budget.